To neatly complement this morning's news regarding the European release of Monster Hunter 3 Ultimate, here's a large helping of Monster Hunter 4 goodness in the form of 24 entirely fresh screenshots, issued by those lovely folks at Capcom Japan. The 3DS exclusive is due to launch in Japan in March next year, with a western release presumably following quite a few months afterwards - Monster Hunter 3 Ultimate comes out in Europe and North America at the same time. We've included a few of the screens below, but you can check out all 24 here. Can never have too much Monster Hunter. The game overall just looks bad visually IMO. But as with most MH games, it's probably going to look a lot better in motion when you actually play it. I'm hoping for a WiiU version later down the line in HD though. I'm still not convinced by the overall visuals of this game at all. 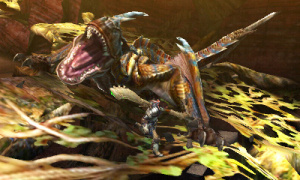 to be honest, the graphics look worse the mh3g. and ive said that ever since the first trailer. i know it probably isnt, and when it comes out they will be atleast just as good. the monsters look good, but they just look funny walking around in an environment that isnt anywhere close. Yeah, that's the problem I have with it too. Unless there's something going on the with the screenshots and footage we've seen it does actually look uglier than the previous games and that just doesn't sit well with me at all. The monsters look fine but the levels and backgrounds just don't look right at all. I'm not a graphics whore, I really don't have to have cutting edge graphics at all, but I'm not gonna accept actually going backwards visually. It's just a wee bit fugly based on all the screens and videos I've seen thus far and I just hope the final product looks somewhat better in real life at least. Otherwise I genuinely would not enjoy playing this because all that would be going through my head every minute of play would be how unpleasant it is to look at. Graphics tech really isn't that important to me but the artstyle and overall visual appeal really are. Knowing Capcom I'm not too worried about the graphics. If they could make Resident Evil Revelation look that good there's really no reason they can't do the same here unless they're giving us a lot of contents and whatnot. I think they haven't given it a final polish yet. And it will definitely look better in motion. It's not finished yet, so I'm not worried that it doesn't look too good, I'm sure it will look much better at it's release. They're probably finetuning the design of the environment before they're updating their textures. Before doing the whole game is done, you need a sample, even if that sample doesn't really look good at all. And we're getting this game afterwards, so I have nothing else to say besides "Thumbs up!" Screenshots always look half as good as the actual game. Isn't this game supposed to load the whole whole map all at once? That might explain why it looks so basic. I hope they'll polish the graphics eventually, but it doesn't really bother me. @19Robb92 - Screenshots of handheld games usualy tend to look a bit iffy. They do look much better in motion. Hurry up and come out and take my money.